It's that time of month again--that magical moment before rent is due, and when it's time for a Daring Bakers Challenge, a monthly online baking event. The Cakespy crew always awaits this moment with bated breath: it's always such a fun opportunity to misbehave. 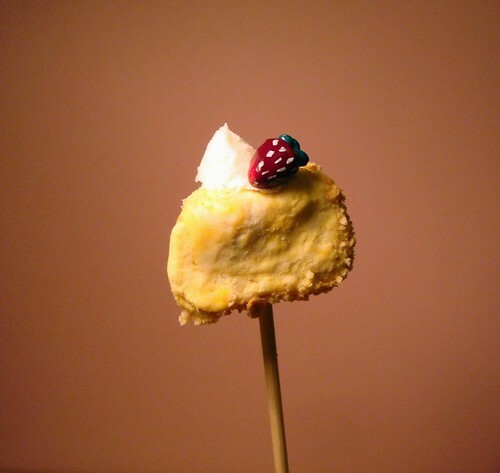 This month, the challenge was Cheesecake Pops, a recipe chosen by Elle and Deborah, from the aptly titled Sticky, Chewy, Messy, Gooey by Jill O'Connor. What could be cuter (or more decadent) than bite sized cheesecakes, dipped in chocolate and served on a stick? 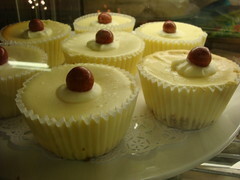 How 'bout mini cheesecakes shaped like slices of "big" cheesecake? See above for our offering. While we offer our apologies for the lack of chocolate dipping, we believe we've more than made up for this omission through cuteness--it has a mini graham cracker crust! And a dollop of faux-whipped cream (made of a daub of cake frosting)! 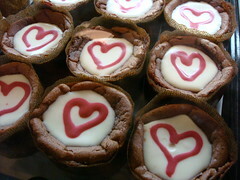 And even a mini marzipan strawberry with glaze! Question: Is cheesecake a pie, or a cake? Answer: Ah, the age-old question. On the one hand, its name speaks for itself--cheesecake. However, there is strong evidence on the pie side: while cakes rise, the cheesecake does not; also, cheesecakes often have a decidedly pie-reminiscent crust. Recently in a heated argument over the subject, a Cakespy acquaintance phoned the Cheesecake Factory Headquarters to inquire on the subject; they say cake. But the evidence to the contrary still bugs us; perhaps this is just a mystery never meant to be solved, or perhaps the true answer will come to us as a vision while on a soulful pilgrimage through the desert. Q: Can I use any type of cheese in cheesecake? A: Cream cheese, Neuchâtel and Ricotta are probably the most common types of cheese used, for their soft texture and high level of malleability. Cream Cheese is particularly popular because its low water and high fat content tends to yield a dense, smooth and creamy result. Quark and Mascarpone versions also exist, as well as soft farmer's cheeses in Pennsylvania Dutch country. While we wouldn't say it's impossible to use other types of cheese, our stomachs tend to curdle (just a little dairy humor) when considering a Swiss or Cheddar cheesecake. A: What is New York Cheesecake? 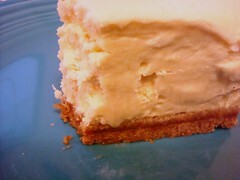 A: New York-style cheesecake, made famous by establishments such as Junior's in Brooklyn, is a dairy-loaded confection: its filling consists of heavy cream, cream cheese, eggs, and sometimes sour cream too: the result is just about the densest, creamiest, dreamiest cheesecake you'll ever find. 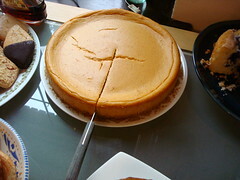 The New York Cheesecake is most frequently, but not always, made using a springform pan; most versions have a graham cracker crust, but of course Junior's famous cheesecake has a sponge cake layer. Q: I have a problem really like wine. Any suggestions for pairing wine with cheesecake? A: According to classicwines.com, you should seek out two traits: Moderate sweetness and some sort of acidity or fizziness that can cut through the heaviness of the flavor and prepare your palate for the next bite. To that end, Moscato d'Asti is perfect: Sweet, rich with the aromas of stone fruits, (like peaches and nectarines) and just the slightest bit fizzy, which cuts through the richness of the cake perfectly. You can also go with a nice German Riesling, which will have both enough sweetness and acidity to make for a great match. For more adventurous palates, Vouvray works beautifully, as does Muscat de Beaumes-de-Venise. And don't forget about Prosecco, which is almost always an excellent partner for desserts of this sort. Q: My cheesecake cracked on top! Do I have to throw it away? A: On the contrary. 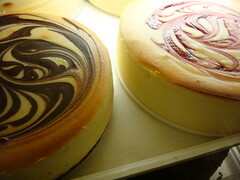 Cracked cheesecakes are fairly common--it is often attributed to over-beaten eggs. However, don't despair! Just take a hot knife to the surface and make like a sculptor to redistribute the cake to smooth the cracks. If so moved, this is a great chance to get artistic with your cake, perhaps creating lovely whirls or design elements to the surface. If still lacking a little flair, perhaps you could consider adding a sweet topping in the likeness of a celebrity visage to cover a multitude of cheesecake sins. Q: Will cheesecake make me fat? *In moderation. As an example of how not to eat cheesecake, consider the example of professional eater Sonya Thomas, who holds the World Record for cheesecake eating, having put away 11 pounds of cheesecake in a mere 9 minutes. Q: I'm lactose intolerant / vegan / or otherwise can't or won't eat dairy. Whaddya have to say about that? A: Go soy! Soft tofu varieties and Tofu cream chees, combined with soy milk or creamer, yield a silky-smooth and absolutely decadent result; even nonvegans may find they don't miss the dairy! 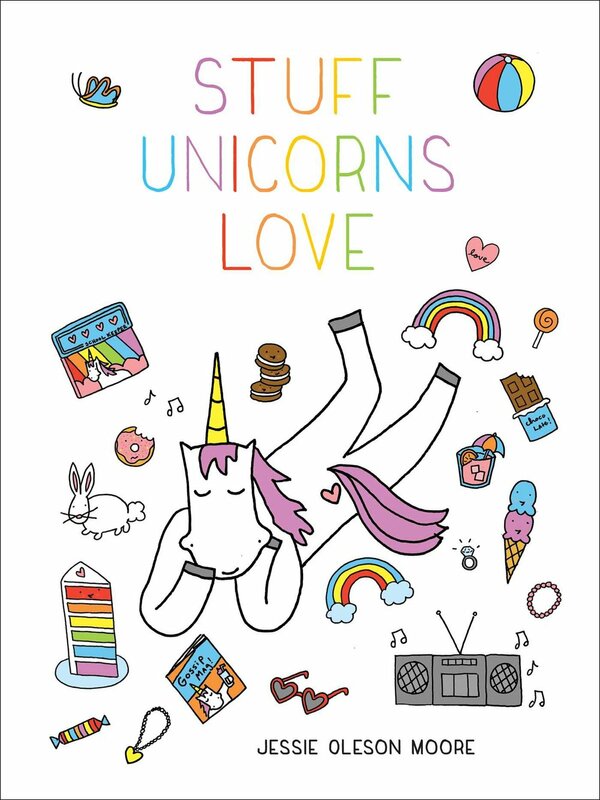 This one looks pretty awesome to us. Q: I like cheesecake so much better the day after it's made! Is there something wrong with me? A: On the contrary. Cheesecake flavors do tend to develop after baking, making the smooth, creamy cheese blossom on the taste buds once the flavors have had some time to set (though truly, we suspect fairies or elves might play a part too). Our serving suggestion? Make your cheesecake, keep it in the fridge overnight, then leave it at room temperature for an hour or two before serving. Sublime. Q: I just did a Google search on Cheesecake and came up with pictures of scantily clad girls. What gives? A: We see you've stumbled upon a classic pinup genre of photography. Here's the story: The "Cheesecake Pose" is said to have gotten its name in 1915 when a newspaper photographer named George Miller noticed a visiting Russian diva, Elvira Amazar, just as she was debarking her ship in New York. Miller asked the opera singer to hike up her skirt a little for the sake of the picture. Later, the photographer's editor, something of a gourmet, is supposed to have exclaimed, "Why, this is better than cheesecake!". So there you go.